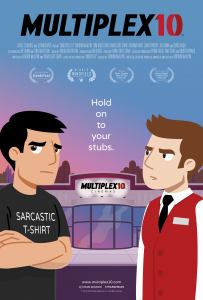 Although Multiplex 10 has ended, an animated prequel/reboot called Multiplex 10 was funded through Kickstarter in 2017 and is NOW AVAILABLE for rent or purchase on Vimeo On Demand, Amazon Video, and elsewhere! And an all-new, irregularly-updated Multiplex 10 web series (set after the short film) recently launched on YouTube! Learn more about the web series on the official Multiplex 10 website! Stay up to date on all things Multiplex, Multiplex 10 and me (a.k.a. Gordon McAlpin) by subscribing to my newsletter!